If you own an older iPhone or iPad and have held off updating to iOS 8.1.3 but desperately want your hardware to be a tad quicker, a newly released video shows you what you should expect in the speed increase stakes with Apple’s new software. Apple yesterday released the latest version of its iPhone and iPad operating system, iOS 8.1.3 and the big news was the blocking of the TaiG, Pangu8 and PP jailbreaks that many had been using. Along with a host of bug and other security fixes, it was hoped by some that the new release would also bring a welcome speed increase to those with older devices. Previous releases had done just that, after all. 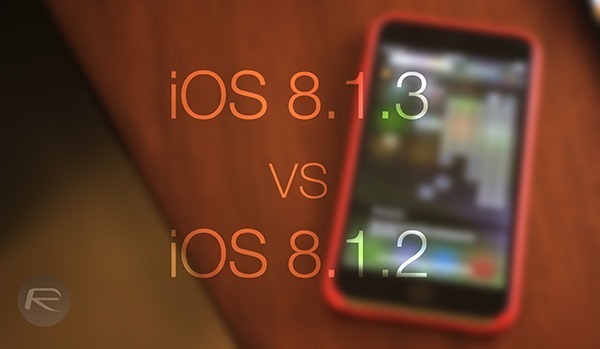 With the question very much on the lips of those carrying hardware from yesteryear one YouTuber decided to put together a video showing what speed difference, if any, iOS 8.1.3 brings to the iPhone 4s. In order to put together a proper test the video shows two identical iPhone 4s handsets but with one running the new iOS 8.1.3 and the other iOS 8.1.2. The test sees a variety of actions repeated simultaneously on both devices, ranging from the launching and closing of apps to taking photographs both of which are pretty common tasks. As the seven minute video shows and as could probably be predicted, some tasks seem to be quicker to perform on iOS 8.1.3 while others seem slower. The only conclusion we can come to here is that performance on older devices wasn’t Apple’s main focus here, and with plenty of bug fixes to be worked on we can’t really blame Apple’s software engineers for that decision. If you’re carrying an iPhone 4s or iPad 2 and find iOS 8.1.3 to still be unbearably slow, and you don’t care about jailbreaking, then we’re afraid the only suggestion we have is to upgrade to newer kit. You’re worth it, after all. Their suggestion is to upgrade your IPad to a “newer kit”. The better option may be just to give up on Apple’s B.S. and go android. Why spend your money on a company who won’t support their existing users? All companies stop releasing updates for their devices at some point. The Galaxy S3 will never see something past 4.4 and is riddled with bugs. Likewise the 4S (an even older device) probably won’t see support going forward from iOS 8.x. Older hardware will continue to work, they just won’t get updates. Which ever phone is free in the iPhone lineup, after two years (typical phone contract) from it going free/latest iOS version being released, it won’t support it anymore. Four total years of support from launch until obsolescence is damn good service. The S3 support ended after 2.5 years of marketshare. More complaints? Keep them coming. Well, that is true if you do ONLY consider official Android releases coming from phone manufacturers. My Galaxy Note 1 runs 5.0.2 fine. Now try another argument. Because, yes, iOS – and generaly most apple hardware and softwares – are closed stuff. Android is a freely modifiable OS. iOS is not. I tried both and made my choice long time ago. And regarding phone contract, you will NEVER get your phone for free. Not seing it mentionned on your phone bill doesn’t mean it isn’t included in the price. Not to also mention that you’ll pay your phone with some interests, going straight into your mobile operator’s pocket. Without you ever being able to notice it. Just check it out. Try another argument? How about the argument that 98% of potential buyers are not going to check XDA and won’t be bothered by flashing different roms on to their phone, much less take the time to read about some underground options of updating their phones. Therefore your argument is invalid.